May 30, 1879. Irving, Ks, 66 deaths. April 5, 1882. Chase , Ks, 1 death. A man lost his life when a tornado destroyed his house along with most of Chase, KS. April 21, 1887. Prescott , Ks, 5:30 PM, 16 deaths. APR 21, 1887 5:30 pm 16 dead 250 injured people from Colony said the tornado felt like an earthquake while it past their city. Graham County was organized for administrative purposes on April 1, 1880, with 1500 inhabitants in the county and with the first county seat located at Millbrook. Millbrook was destroyed by a tornado on August 4, 1887, and the county seat was moved to Hill City on March 10, 1888. Mr. J.R. Pomeroy, who assisted Mr. Hill in developing Hill City, donated most of the tract of land on which the courthouse was built. This site is still being used for a modern courthouse. Info supplied by Bo Schindler Sgt/ USMC amateur storm spotter. May 27, 1892. Wellington , Ks, 17 deaths. A powerful tornado struck, leveling 100 homes and 17 businesses.100 injured Harper three deaths; Two died near Kellogg. June 21, 1893. Jefferson County, 6:30 PM , Ks, 11 deaths. 30 injured, 6 died in one family. May 15, 1896. McPherson County. Ks 4:00AM, 1 death. An elderly man in his home was killed when the tornado hit. May 17, 1896. Palmer, Ks, 25 deaths. Devastated the towns of Seneca, Oneida, and Sabetha, leaving the farms in between “as bare as the prairie.” The tornado may have been almost two miles wide as it passed near Reserve, Kansas. A half-mile-wide, violent tornado cut a swath through 27 farm homes. Newspapers reported that “everything was leveled as if a roller had passed over it,” and the body of a dead child was reportedly carried for a half mile. May 5, 1905. Ellsworth/McPherson counties, Ks, 29 deaths. 1913. Lawrence, Ks, 2 deaths. A couple was killed in their house. More info needed. October 9, 1914. Rural Galena, Ks, 5 deaths. Thanks to Victoria Sills for the information. The tornado struck in the early evening, completely destroying the home and all out buildings, as well as killing 5 members of the family. November 10, 1915. Great Bend, Ks, 11 deaths. May 25 1917. Sedgwick/Marion counties, Ks, 23 deaths. June 1 1917. Coffeyville, Ks, 2 deaths. November 1917. Great Bend, Ks, 11 deaths. I would like to personal thank Jackie Langholz for the help in tracking down this information. October 8, 1919. Hoisington, Ks, 4 deaths. 60 homes were destroyed and 25 people were hurt. May 7th, 1927. Hutchinson, Ks deaths 10. F4 Tornado made a path from north of Hebron, Nebraska, and moved South East down into Kansas. Two people were killed in Nebraska, five were killed in Kansas. It was said to have tossed cars like toys. Thanks to Millicent Craig alerting us to this tornado. Her husband Samuel Craig was in that tornado and survived besides helping try to rescue survivors. April 29, 1942. Oberlin, Ks, 15 deaths. The tornado was 300 yards wide and traveled for 20 miles on the ground. June 08, 1950 . McPherson County, Ks, 1 death. May 25, 1951. Clay County, 1 death. June 23, 1951. Morton County, 1 death. June 23, 1951. Stevens County, 1 death. June 27, 1951. Trego County, 5 deaths. May 25, 1955. Sumner County, 5 deaths. May 25, 1955. Udall, 83 deaths. More than 270 people were injured, when a large F5 tornado hit at night. The year the Udall tornado hit marked one of the first years that the government would allow tornado watches, this was due to the fact that they were afraid that in previous years that if a watch was issued that it might cause panic. There were reports that there was a tornado watch out, but that it was canceled by the local media an hour and a half BEFORE the tornado hit. April 02, 1956. Elk County, 1 death. July 12, 1956. Scott County, 1 death. May 20, 1957. Spring Hill, 7 deaths. June 10, 1958. El Dorado, 15 deaths. May 19, 1960. Shawnee County, 1 death. April 12, 1964. Leavenworth County, 1 death. June 8, 1966. Leavenworth County, 1 death. June 8, 1966. Topeka, Ks 17 deaths. 550 people were injures when this F5 tornado smashed into Topeka. June 9, 1967. Cloud County 1 death. June 23, 1967. Finney County, 1 death. May 13, 1968. Wichita County 3 deaths. May 26, 1973. Sedgwick County 3 deaths. September 25, 1973 Ottawa County 1 death. September 25, 1973 Washington County 2 death. June 8 1974. Emporia Ks, 6 deaths. May 31, 1978 Jackson County 3 deaths. June 17 1978. Osage County, 16 deaths. June 19 1981. Douglas County, Ks 1 death. March 15, 1982. Cherokee County, Ks 1 death. March 15, 1982. Crawford County, Ks 1 death. March 15, 1982 Montgomery County, Ks 1 death. May 6, 1983. Shawnee County Ks, 1 death. October 31 1984. Osage County, 1 death. March 13, 1990. Hesston, (2 deaths Outside of town). This was a large F5 tornado, that destroyed the town of Hesston. The only reason there were not more deaths was because of the amount of people that took the storm serious and took shelter. April 26, 1991. Elk County, Ks 1 death. April 26, 1991. Cowley County 1 death. Many houses destroyed. This tornado was on the ground for about 30 miles. April 26, 1991. Wichita/Andover, 20 deaths. This F5 tornado was on the ground for about 70 miles, from Clearwater in south-central Kansas to Cassoday in northern Butler County. It was on the ground for about 50 minutes, and caused 302 injuries. May 7, 1993. Russell County, Ks 1 death. May 3, 1999. Sedgwick County 6 deaths. F4 tornado hit Haysville then Wichita. First count was 5 people killed, until 3 weeks later when an elderly man passed away from his injuries. Bring the total to 6. April 21, 2001. Hoisington, Ks, 1 death. Two intense supercell thunderstorms then developed further south, across portions of southeast Kansas. One produced a tornado which tore through portions of Crawford County. This tornado touched down shortly after 4:30 p.m. in Neosho County, and it quickly intensified into a violent F4 tornado as it moved across Crawford County. This tornado narrowly missed the city of Pittsburg as it passed northwest of that city and instead tore through the Ringo and Franklin areas. In the wake of its 27 mile path across Crawford County. the tornado killed three people in Crawford County and left over $7 million in damage. The tornado also took one additional life and produced over $5 million in damage once it crossed the state line into Missouri. seven miles northeast of Melrose, where the tornado produced F-2 damage. The tornado was on a direct path to the home, but it only damaged the roof and windows. Several large trees right next to the house were uprooted or snapped off, indicating the power of the tornado. May 4, 2007. 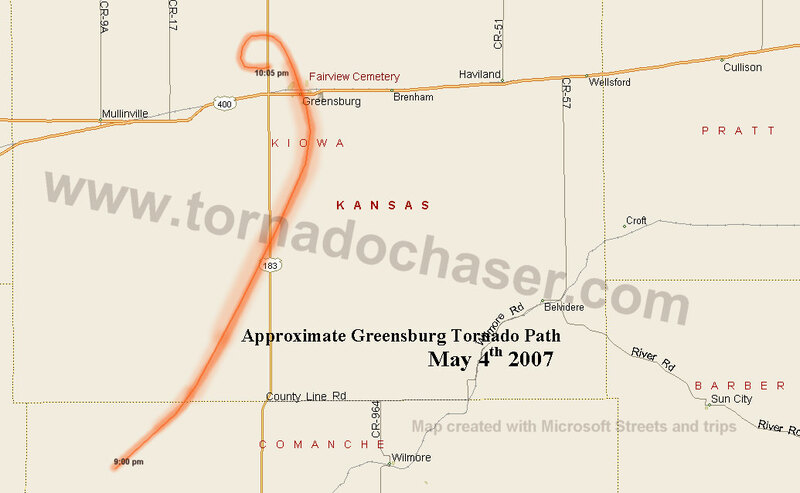 Greensburg, Ks, EF5 10 deaths. SPC reports of tornadoes for that day archive page here. This is a map I created from information I found on the Dodge City NWS website. 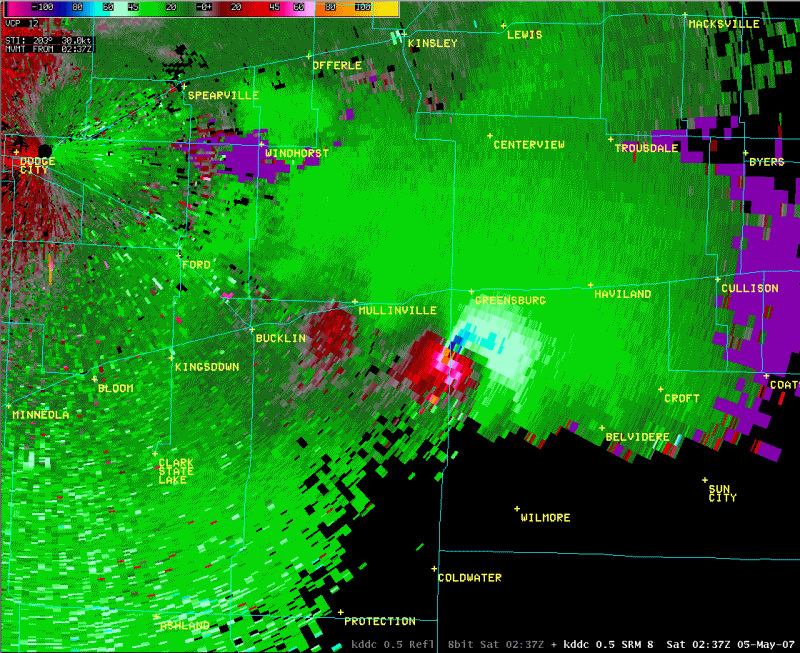 The map shows the tornado on the ground for well over one hour and hitting Greensburg dead on. 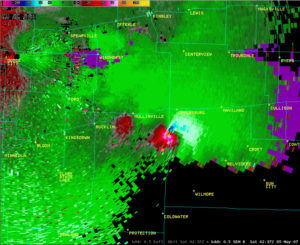 Here is an image of the Doppler radar velocity image from NOAA National Weather Service office in Dodge City Kansas showing the tornado as it moved in on Greensburg Kansas. NOAA forecasters in Dodge City were able to issue a Tornado Warning 39 minutes before the 1.7 mile wide wedge tornado hit the town. Noting intensification in radar images and a bearing directly toward Greensburg, Dodge City weather staff updated with a Tornado Emergency message 10-12 minutes before the twister hit urging residents to get to shelter immediately. 1 fatality was reported in Ottawa County, Kansas near a county lake. It hit an area known as cabin row on 190th Rd. killed a woman in her camper and leveled homes and trees. Thanks to John Blessing for sending the info. The tornado picked up a car and carried it approximately 1700 feet into a wheat field, killing the male driver and female passenger (who was ejected). The car was nearly unrecognizable and the fatalities were not discovered until the following day. One death was reported when a tree was blown onto a woman who had just put here daughter into the carseat of her vehicle. A mobile home was destroyed and the occupant sustained fatal injuries.